The Zangler Girls in the Gateway Theatre production of Crazy For You. Photo by David Cooper. New York may be almost 5,000 kilometres from Richmond, but there were so many Broadway worthy moments in the Gateway Theatre production of Crazy For You, you could be forgiven in thinking you had just stepped out of the theatre onto the Great White Way. [pullquote]Even as Beatty and Blackburn are the stars, the polish on this production comes from the large ensemble that is as good as it gets and who account for many of this show’s Broadway worthy moments. [/pullquote]What makes that statement surprising is that the majority of the cast in this musical created around the music of Ira and George Gershwin are non-professional. In fact, in this very large cast of 24 there are only two Equity players. But what is even more surprising is that director Barbara Tomasic and choreographer Julie Tomaino have managed to instill such vivacity into Ken Ludwig’s rather uninspired story. Largely a reworking of the Gershwin’s 1930 musical Girl Crazy, and which also borrows from the brother’s vast songbook, it tells the story of Bobby Child who dreams of dancing on Broadway instead of working at his family’s bank. Sent by his overbearing mother to Dead Rock, Nevada to foreclose on the local theatre, the rest of Ludwig’s plot is about as unsurprising as the love Bobby finds in this desert backwater. But thanks to a stellar cast, under Tomasic’s direction and the exhilarating choreography from Tomaino, the show’s slight and predictable story is forgiven. Gaelen Beatty as Bobby and Kate Blackburn as Polly. Photo by David Cooper. As Bobby, Gaelan Beatty is so smooth that, to paraphrase Globe and Mail theatre critic Kelly Nestruck who said the same of Donny Osmond: “you could fill a glass with his voice and leave it out for Santa if you ran low on milk”. And his dancing is just as slick. Paired with Kate Blackburn, who brings just the right amount of girly-girl and cowgirl to her to the role of Bobby’s love interest, the two are an absolute delight. 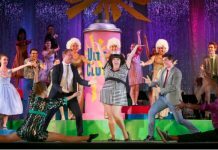 Even as Beatty and Blackburn are the stars, the polish on this production comes from the large ensemble that is as good as it gets, and who account for many of this show’s Broadway worthy moments. While the entire cast proves they can dance to Tomaino’s sometimes breathtakingly complicated choreography, it is the Zangler Girls that are so good that you would swear they really had just stepped off a real Broadway Follies stage. The ladies’ first appearance from the Child’s family Rolls Royce is so eye-poppingly fun that you would swear they have nowhere else to go, but they only got better as the equally talented men’s chorus was added to the mix. Standouts among the men are the trio of David Z. Cohen, Caleb Di Pomponio and Ben Purych who create such perfect harmonies in “Bidin’ My Time” and “The Real American Folk Song is a Rag”. It is no wonder Gateway keeps bringing set designer Marshall McMahen back, with a moveable set that transforms effortlessly between the various scenes, it is no wonder there was an audible appreciation when it first morphed from the exterior of Dead Rock to the interior of Lank’s Saloon (and hotel). And Carmen Alatorre’s costumes are absolutely gorgeous, especially on the women. Musical director Christopher King keeps his orchestra as tight as the kicklines. In our recent interview with director Barbara Tomasic, she said her father “would be very pleased” with what she has done with his favourite musical. That has got to be the biggest understatement of the season. Crazy For You. Music and lyrics by George Gershwin and Ira Gershwin. Book by Ken Ludwig. Directed by Barbara Tomasic. A Gateway Theatre production. On stage at Gateway Theatre (6500 Gilbert Rd, Richmond) until December 31. Visit http://gatewaytheatre.com for tickets and information.